Every year in January the top 2,500 business and political leaders gather in Davos, Switzerland at the World Economic Forum to discuss the most significant issues impacting the world. This year, leaders of the largest technology companies including Satya Nadella (CEO, Microsoft Corporation), Sheryl Sandberg (COO, Facebook), and Mark Benioff (CEO, Salesforce) attended. Fittingly, one of top key themes of the meeting this year was “Mastering the Fourth Industrial Revolution”. 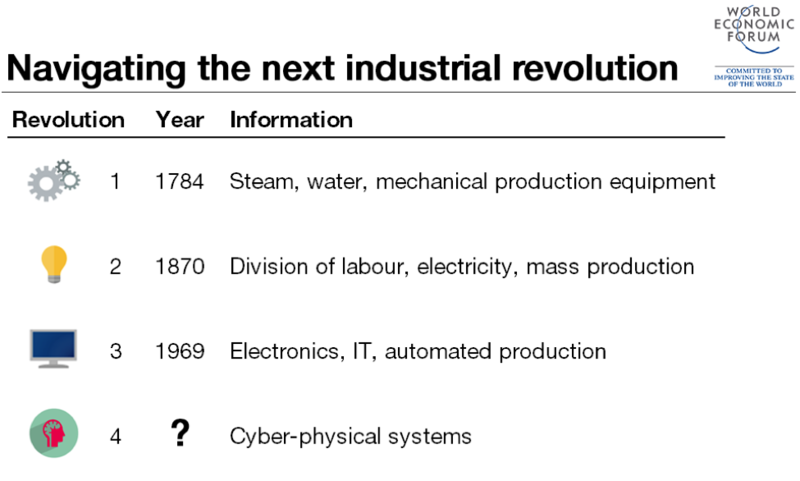 The Fourth Industrial Revolution is not a product revolution, it is a system revolution, notes Klaus Schwas, the founder of the World Economic Forum, in his position paper Fourth Industrial Revolution: What It Means, How to Respond. According to him, the world is in the midst of the Fourth Industrial Revolution where we are at the tipping point of a whole variety of interconnected technology breakthroughs: robots, drones, intelligent cities, artificial intelligence, and brain research. The impact of the Fourth Industrial Revolution is evident in our everyday lives as we are overwhelmed with innovation and technology breakthroughs in artificial intelligence, connected devices (the Internet of Things), 3D printing, self-driving vehicles, continuous connectivity and infinite computing power. These technologies are changing the world in a profound and unpredictable way, and at a much faster rate than ever before. Both the sheer volume of innovations and the rate of change is daunting. It will most certainly force a wholesale transformation of businesses and processes as we know them today. Healthcare and pharmaceutical industries are no exception and perhaps provide one of the biggest opportunities for a positive impact. Joseph Jimenez, CEO of Novartis describes the future of healthcare in his article Three Ways the Fourth Industrial Revolution Can Transform Healthcare , where he predicts the fourth industrial revolution could not only transform the future of disease management and elder care, but could also help us find new cures by accelerating the science of genomics. Clinical trials serve as the engine for bringing new treatments and therapies to consumers as the pharmaceutical companies need to test those on a select group of patients in a controlled setting before they are approved to be marketed to the general population. The Fourth Industrial Revolution has the potential to transform clinical trials and thereby improve the quality and safety of these life enhancing therapies and accelerate the pace with which they are brought to market. Here are three ways that clinical trials may be transformed. The vast majority of clinical trials today are conducted without direct input from patients as most clinical data are collected by healthcare providers during patient visits. However, billions of people are already carrying connected personal computing devices including smart phones and tablets and billions more will be connected through wearable devices soon. This provides the opportunity to capture information directly from patients in a frequent and timely manner as they enter that on their personal mobile devices. Better yet, data for non-communicable diseases such as hypertension and diabetes can be captured and transmitted directly through wearable medical devices. As a result, the information captured will be much more detailed and of higher quality - thereby increasing the speed and effectiveness of clinical trials. “Conventional methods of collecting data in clinical trials has reached its limits and sponsors need to change the paradigm”, says Jack Lawler, Executive Director, Clinical Operations at Egalet, a specialty pharmaceutical company, which focuses on developing and commercializing medicines for patients with moderate to severe pain. “Collecting clinical trial data exclusively from investigators and at clinical trial sites alone is no longer cost effective or sufficient as these studies do not reflect real world situations. The conventional clinical trial setting is a sterile environment and data collected directly from the patients is a better reflection of what happens in the real world setting” says Lawler. He advocates collecting Clinical Outcomes data directly from patients through electronic methods, also knowns as ePRO or electronic Patient Reported Outcomes, to supplement data collected by investigators. Sponsors need to think strategically and beyond regulatory approval and collect data that gives them insights into how the drug will perform in a real world setting. This can help them avoid costly and unnecessary problems that might arise post approval. Wearable technology is an emerging and fast growing segment of technology market. It is expected to grow from $20B in 2015 to $75B by 2025 according to a report by research firm, IDTechEx. “A significant increase in usage of wearables and devices to collect patient data in clinical trials is likely as these devices can provide data such as mobility, sleep, heart rate that would otherwise be unavailable” says Steven Carr, Director Clinical Development at CSL Behring. He advises companies to move forward carefully as patient privacy, consent to share data and security issues such as ensuring the wearables are indeed on the patient throughout the duration of the trial and not shared with others are serious matters that must be handled carefully. “Additionally, technology could be used to share clinical trial progress with the patients during the trial and the study results after they are published. Typically, trial status/progress is known by the trial administrators, but don’t you think the participants would embrace knowing this information along the way?” adds Carr. Emmanuel Mawet, R&D Project Manager at Ipsen Pharmaceuticals, is also optimistic about the future of wearable devices in clinical trials, however, he advises pharmaceutical companies to carefully evaluate how the data collected are used. He also thinks pharmaceutical companies should be very transparent with regards to the outcomes of the trials, especially when the investigational product does not achieve regulatory approval, to earn higher trust and engagement from patients. Peter Benton, President & COO of Worldwide Clinical Trials, a global CRO specializing in cardiovascular disease, chronic inflammatory disorders and CNS, brings up the human aspect of clinical trials in today’s hyper-connected world. Patients and their families, in the case of ultra-orphan or rare diseases and genetic disorders, sometimes know more about the diseases than the researchers do. They often band together, create online chat boards, communicate and share findings, or even conduct their own research on diet and exercise to find ways to improve the condition of their loved ones. Their level of knowledge is remarkably higher than that of the general patient population, and they often want to review the protocol with a fine-toothed comb with the investigator and researchers to ensure the trial is designed well for their loved one. The benefit to the researchers, says Benton, is that these patients remain fully compliant and deeply involved through the trial to ensure its success. Imagine an EDC or eCOA system that is connected with the IVRS, which tracks the investigational product in real-time enabled by the Internet of Things infrastructure. These connected systems will allow scenarios such as scheduling the patient visit based on the availability of the investigational product. Clinical trial systems will move into the cloud and will have the ability to communicate with people, other systems, devices and supplies via support of standard protocols such as SAML and Oauth for security and identity management, published API for integration, and built-in workflow engines for orchestration. These systems will seamlessly connect people, facilities, equipment and supplies in real-time to enable more efficient and effective clinical trials. A key obstacle to creating truly interconnected systems is the lack of consistent standards and technologies in the healthcare industry, says Mawet. According to him, while UK and the Scandinavian countries have near 100% adoption of electronic health records (EHR), southern European countries significantly lag behind in adoption of EHR. Similarly, complying with varying patient privacy and data retention policies across the globe is another aspect of integration that must be handled carefully. “While systems and technology used in clinical trials are improving, progress to date has been slow compared to other industries. While many studies today are paperless, there are still studies being run on paper,” according to Benton. In fact, in a recent survey of 1,500 clinical site study coordinators and raters conducted by Worldwide Clinical Trials, it was found that 67% of respondents preferred paper-based assessments. “There are some concerns about the interference of the digital device with the patient-clinician relationship, and the potential impact on the data,” explained Benton. This shows we have a need for better training in how to effectively use these systems in a clinical setting. However, he posits that pharmaceutical industry has been conservative in terms of technology adoption, and he is confident that the pace of technology adoption will accelerate. A fully connected clinical trial platform, or an “eClinical platform,” is what Benton envisions in the future that will manage all aspects of the clinical trial. He expects this eClinical platform to either connect or replace the silos and disparate EDC, IRT, safety and CTMS systems of today that are often purchased and then assembled together by technology providers. For pharmaceutical companies, signing up investigators and patients for clinical trials is a time consuming and expensive process that relies heavily on whom you know and how much money you spend on traditional media and recruiters. On the other side, investigators and patients have few options and no reliable sources for what clinical trials they can participate in. Cloud-based clinical trial systems will make signing up for trials simple by publishing online listings of available clinical trials and directories of investigators and patients. Investigators and patients will be able to publish and share the credentials and vitals easily and securely through systems that will share just the information they authorize with the right parties. The obvious benefits of crowdsourcing are lower costs and higher availability, however the impact is likely to be much greater and transformational. “When a productive marketplace unfolds for clinical trial patient recruitment, clinical trials will evolve from the fixed-location, investigator-based clinical trials of today to trials organizing around the patient. We will also be able to harness the collective input of the emerging participant community for trial design elements such as inclusion and exclusion criteria” says Scott Ballenger, President of Trial Acceleration Institute and founder of HeroLinx, a crowdsourcing clinical trial recruitment platform. These marketplaces will have no boundaries and will significantly increase the potential pool of patient participants. “Cloud-based clinical trial systems could enable patients to engage in study protocol creation by exchanging ideas with investigators, who in turn collaborate with trial sponsors regarding study designs. When patients are heard, their participation, engagement, and retention could increase,” says Carr. Mawet advises companies to carefully adhere to country regulations as more information is shared about potential treatments to patients. While we don’t know exactly how long it will take for the Fourth Industrial Revolution to completely transform clinical trials, we can be certain that change is inevitable. Benton urges companies to be more daring and innovative. He challenges the industry to take bigger steps toward fully integrated systems. In his words, “If Tesla cars can drive themselves on the roads and park themselves in the garage, why can’t we have a fully connected clinical trial platform that effectively manages all aspects of the clinical trial?” Likewise, Mawet is similarly optimistic about how technology will improve the way clinical research is done in the future. He wonders whether the change will come as fast as we expect or in the form that we anticipate. He is, however, confident that it will be very different from what we see today. For progressive organizations and entrepreneurs, this presents a tremendous opportunity to improve upon existing solutions and services or create completely new offerings. For others, it will be necessary to adapt to these changes just to survive. How is your organization planning to participate in the Fourth Industrial Revolution? Zikria Syed is a Life Sciences Entrepreneur and Technologist. He can be reached at [email protected].